← Low-carb adventures: egg muffins! 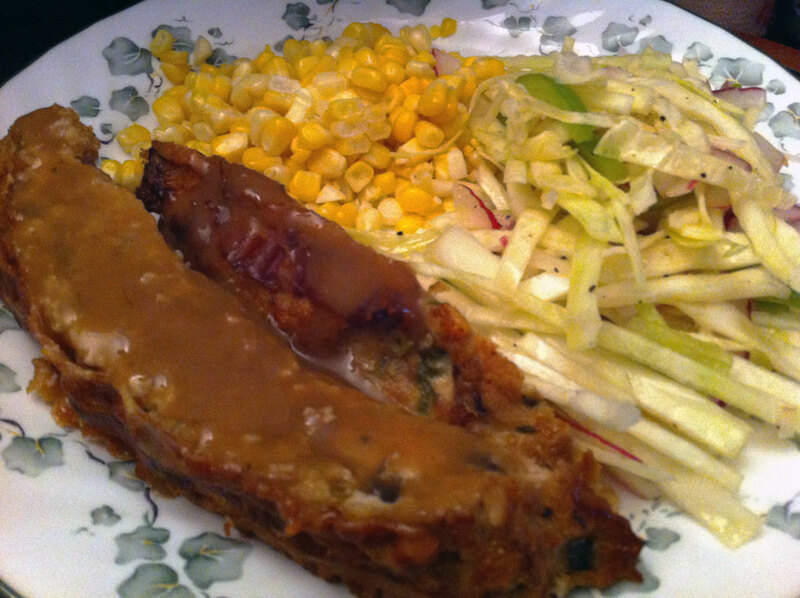 Low-carb adventures: ground chicken meatloaf! In a bowl, whisk together the vinegar, olive oil, dry mustard, pepper & brown sugar. Mix together the vegetables and put into a large ziplock freezer bag. Pour the vinaigrette over the vegetables and seal the bag. “Smush” everything together in the bag, shaking it around, turning it over and over, to make sure all the veggies get coated. Refrigerate for 24-48 hours before serving. Spray a baking sheet with non-stick cooking spray. DO NOT LINE IT WITH FOIL — it will stick to the meat! This one’s easy: mix all of the above ingredients, by hand, in a large mixing bowl. Form the meat mixture into a wide yet not terribly high loaf. I find it cooks better this way. If you prefer, you can form it more into a traditional loaf, put them into muffin tins or whatever you prefer. Line the bacon along the top of this loaf, side by side. You should be able to fit all 12 slices on — I use the bacon slices as guides for cutting it once it’s done, too! Each width of bacon is a single portion. Easy! Bake for 50-60 minutes or until the internal temperature is 165F. Serve with coleslaw and a vegetable of your choosing. This entry was posted in altered recipes, Carb-friendly foods, comfort food, dinner, experiments, Lunch, nutritional values, oven, recipe and tagged apple cider vinegar, bacon, beef, cabbage, dijon mustard, egg, extra virgin olive oil, green onions, green pepper, olive oil, pepper, red onion, skim milk, stovetop stuffing, stuffing, vinegar. Bookmark the permalink.